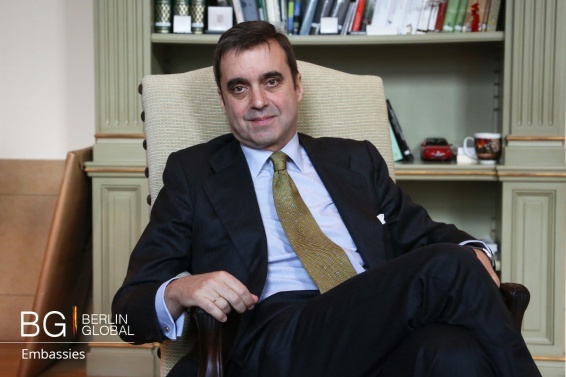 Since March of 2012 the Spanish Ambassador to Germany has been Pablo García-Berdoy y Cerezo. Previous to this, he was appointed Consul of Spain in Manila, Philippines. He was a technical advisor in the Ministry of Foreign Affairs and also an advisor at the Secretariat of State for the relationships with countries of Central and Eastern Europe. Another highlight of his professional career was when he was working as Counsellor at the Spanish Embassy in Bonn (Germany) in December of 1991. In 1996, he held the position of Director of the Office of the Secretary of State for the European Union. Mr García-Berdoy y Cerezo also held the position of Ambassador of Spain in Romania and Moldova before moving to Germany. First of all, for what reasons did you want to become an Ambassador and how important do you think the role of being the Spanish Ambassador to Germany is? I am a career diplomat and I started to be a career diplomat in 1996, so my idea was to follow the civiil service and I wanted to follow the civil service especially in foreign affairs and then you become an Ambassador or not, that depends very much on several circumstances. Being an Ambassador was one of my dreams if I may say so, because I did part of my career in Germany. I was posted in Germany from ‘91 until ‘95 and I have been dealing with European affairs during my career and I was especially focused on Germany so being Ambassador in Berlin is something that is important in itself but professionally very fulfilling. With regards to the current economic and political situation in Spain, how are foreign embassies such as this one contributing to helping Spain tackle such issues? I have been here for almost four years and since the very beginning the times were not easy because the crisis was very strong and the impression in Germany was very negative, so we had to overcome that impression due to two factors. First of all to explain to the Germans what the reality of Spain was about what we were doing at home and secondly to explain the efforts that the Spanish government had to deal with and ask them for a more comprehensive approach in tackling the European crisis as a whole. We had a national problem but we also had a European problem, so my main target was to introduce both sides of the coin into this bilateral dialogue and I think we succeeded. Now we have a different type of approach, there is a political stalemate in Spain although the economic situation is much better the new political discussion makes me explain to the Germans what sort of political debate we are dealing with and this is quite normal since we have to transport to the local society, to media and to the local politicians what you are doing at home and what your main targets are. Due to the good relationship between the German and Spanish Governments nowadays, do you believe there could be new cultural or economic agreements between Spain and Germany that could enhance our market and cultural institutions? Well the agreements are so thick we don’t need many agreements what we need is to fulfill what we have. We have a lot of connections through the European Union membership and we have many bilateral things but if we talk about cultural affairs the relationship cannot be stronger than it is because we have been doing during these months the most important cultural presence in the history of Spain in Germany in many years. We had exhibitions of: Picasso, Miro, Turbaran for the first time and last week one of Soroya. And this year 2016 is the year of Spain in Berlin in the Gemälde Galerie there will be in June the most important exhibition of the Spanish barroque. So we have a very broad range of activities also dealing with music, modern art, performances by new generations of artists so I am very satisfied. In terms of sociological connection Spain is the first destination for German tourists. So everyone goes in the same direction that is a very tight and strong relationship. And concerning the market? Because you emphasized the cultural relationship but what about the market, do you think Germany can contribute to improve the market situation in Spain today? Well, yes from a trade perspective we have an increasing amount of exports here in Germany, actually we are exporting more than any time in our history to Germany and the Germans are recuperating the market after the Spanish crisis so the trade balance has been growing steadily in the last months and years. Then we have a very strong flow of investment on both sides. I always say that when I arrived to Germany in 1991 there were no Spanish companies and now if you consider the big companies, the first construction company of Germany is a Spanish company, the first, in number of clients, IT company is Telefonica, one of the first banks in Germany is Banco de Santander. We have so many people working in the automobile industry that we are now the second producer in the European Union of cars after Germany and we are in the top 8 now in the world and that has a lot to do with the cooperation between the two countries, for instance when you sell a Mercedes to China or you sell an Audi or a BMW in Japan you are also selling Spanish parts, and part of our trade surplus in third countries is due to the fact that we sell together a lot of things through the car industry. Considering culture how is this Embassy promoting Spanish culture around Germany? We are doing on a permanent basis three types of activities, first of all we are trying to cooperate with the local institutions which is the main target so we have a very good network of German institutions who are dealing with Spanish art, culture etc. and we are working with them, we are looking for cooperation with Spanish institutions and with finance, Spanish business people etc. The second thing we are doing is we are trying to get to know what is of interest in Spain to project here and we look for Spanish intuitions to find a way to work with German institutions. The main thing is to have local cooperation and local complicity without that local complicity, culture doesn’t move properly. If you want to do things by yourself, completely independent of society, you are not going to have success. The third thing which is important is how we use our network in Germany, we have one, if not the biggest network of any Embassy in Germany with five cultural institutes in Germany (the Cervantes Institute) including this Embassy where we do exhibitions every two months, we do concerts, we do seminars on a regular basis, this Embassy is permanently on the spot with cultural affairs. So with five cultural institutes all over Germany, the Embassy with its own institutional building facilities and then what we have is this great amount of local and Spanish institutions that work together. Speaking from a more general perspective how does this embassy promote cultural diplomacy? Because we mentioned Spanish culture but concerning cultural diplomacy that it is a very important tool to bring societies together and challenge differences between the different societies, so does this embassy promote or utilize cultural diplomacy? That is a key part of our work, what we do is on a permanent basis, regular activities with the local societies, so I personally deal with this on a personal basis, for example today I am meeting with 35 young students about Europe and we will explain to them what is the Spanish position regarding the refugee crisis for instance or we talk about what we are waiting for the new institutions to deliver in terms of the monetary union and this is one foundation that comes to me and we have a dinner, next week we will be doing other activities either in Berlin or outside. I have this week for instance the Minister coming for the Tourism Fair and then we will be going through the fair with together, I will explain how we deal with this connection to tourism, culture, gastronomy etc. We do such things on a regular basis. What kind of remarkable achievements have been made over the years by the Spanish Embassy in Berlin? I think that what we have been able to do is to have a very high profile. 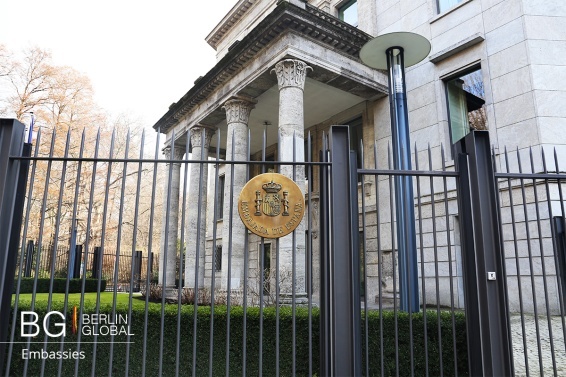 We are an embassy that thanks to this wonderful building and location and effort of all the colleagues has a presence in most of the areas of the German society. The colleagues working here in different areas do a lot of activities in labor, environment, education we have a very high profile and we want to remain very high in this profile because it helps the Germans to understand our country better and helps the Spaniards to have a better instrument to influence in the local and national debate and to be involved in the german society which is very important. We need to do this in a very global way so including fiestas but also seminars, including art and economy, culture but also education, all things put together to show to Germany and European partners that we are a big country with something to say in the world.